This year has already proven to be one of upheaval in the local used-book/movie/music market. It was just about a month ago that I was talking about Jelly’s Aiea closing; turns out that when the Aiea store closed, the Kakaako Jelly’s immediately renamed itself Idea’s Music and Books, relegating the “Jelly’s” name to the bargain bins of history. We’re coming up on the targeted June 1 opening date for the Japan Village Walk. And thanks to a tip Saturday afternoon from Facebook friend Kele Miranda, I now know what’s happening to Book Off Ala Moana. But before you go into mourning and/or load up everything you can carry to sell it back to them before they stop accepting items, you should know the bright side to this story: They’re not disappearing from the local scene completely. They’re just moving a few blocks up to the Don Quijote on Kaheka Street. Opening day is April 1 (no fooling!). 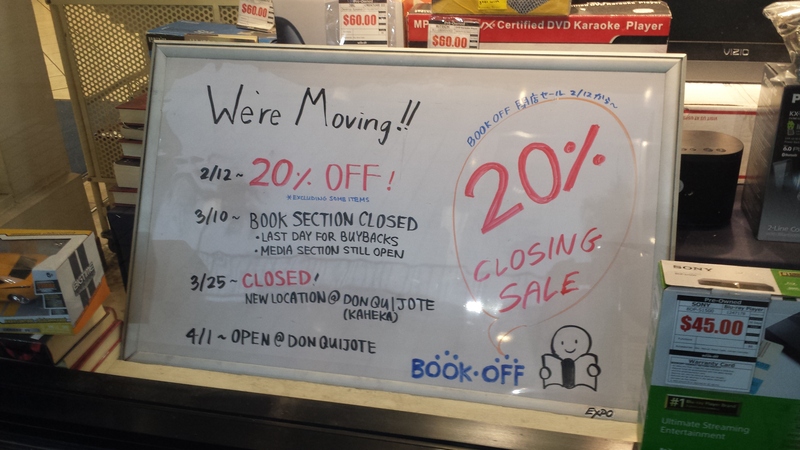 So consider Book Off’s final sale at its old location more of a “see you later” statement than “goodbye forever.” It’s still pretty good, though: 20 percent off almost anything in their section. Brand-new electronics and iPads are excluded from the sale, but pretty much everything else is fair game. Heck, I picked up an Xbox One — the spiffy 1 TB Elite edition, no less! — for under $290 after discounts immediately after I heard about the sale. Indeed, there are bargains to be had. There will be a better selection the earlier you go, of course. Just keep in mind the various closing dates: The book section closes March 10 (which will be your last chance to sell anything back at that location), while the media section (with music, movies and games) shuts down on March 25. Get your used anime, manga and other goodies at cheaper prices while you can. Book Off’s hours are 9:30 a.m. to 9 p.m. Monday to Saturday, 9:30 a.m. to 7 p.m. Sunday; call 952-9115. Now I have a serious reason to leave the house and go shopping. Thanks for the tip! Next Next post: Ota-cool incoming: Sale-abrate good times, come on!